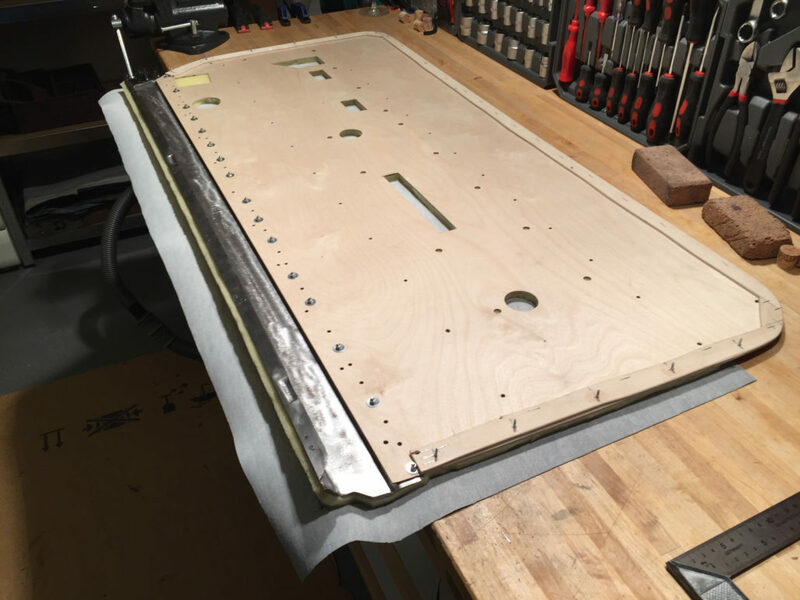 In the last issue, I explained how I prepared the door panel before applying the vinyl and carpet. I mentioned, I had used a foam that was a little too thick which made it difficult to attach the crank for the vent window and the wood panel. 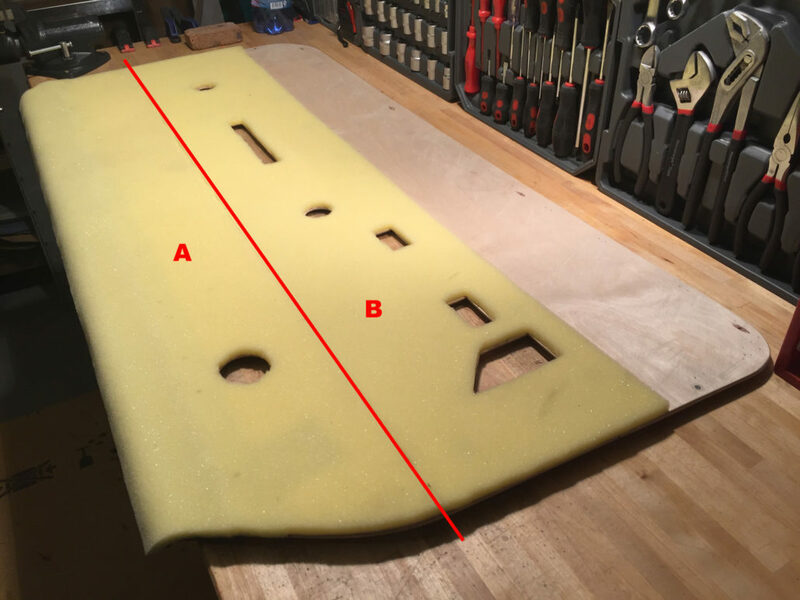 But I still recommend a foam thickness of about 2-3mm for the upper section “A” (Fig.1). For the lower section “B” a thickness of 5-7mm will work well. The next step is to cut the vinyl and carpet (Fig. 2). It is very important to ensure that the vinyl has enough of an edge on the sides and top so that it can be folded over the panel and attached. I suggest an overlap of 2 cm (Fig. 3). 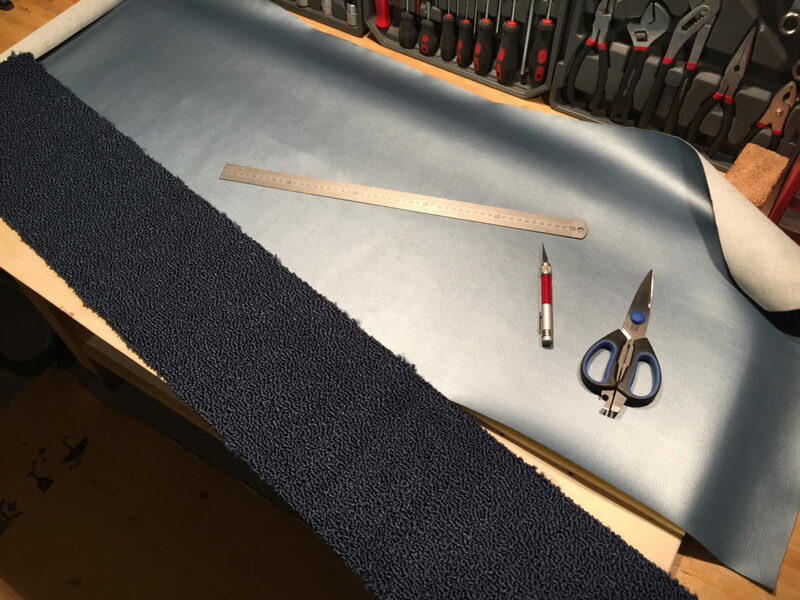 At the lower edge of the foam there are holes which are there to attach the metal strip separating the vinyl and the carpet. At this time it will be helpful to mark the lower edge of the vinyl with a pencil allowing for a 1-2 cm overlap at the lower edge of the vinyl. Once the vinyl is properly cut, it can be glued with a contact adhesive spray. The easiest way is to put the vinyl on the floor backside up and spray the entire surface. Let it dry for 2-3 minutes. Then gently hold the vinyl at the corners and carefully place it on the panel and press it firmly. I used my wife’s kitchen roller, a bottle or a thick tube will also work. Carefully cut out the holes with a sharp X-Acto hobby knife or scalpel. Now the pre-cut carpet can be glued onto the lower wood panel. It may be best to spray the back of the carpet as well as the wood making sure the new upper vinyl panel is well covered to avoid over-spray. Let the glue dry for a few minutes, as you did with the vinyl. After it has dried, cut off the excess carpet along the edge of the wood with a carpet cutter. Clear a space on your work table to prepare a vinyl strip for the outer edge around the carpet. The strip should be 4-5 cm wide and long enough to cover the sides and bottom of the carpet. If you do not have a strip long enough you must attach two shorter strips as I did. I used a small piece of vinyl and the same contact spray to attach, cover the seam and strengthen the bonding of the two strips. (Fig 5). If a hem is needed, I recommend it be placed in the lower center. The next step is to attach the strip to the outer edge of the carpet. To help get the outer edge even, lay the vinyl on its face and draw a straight line at 1 cm. After lining up the edge of the vinyl with the lower edge of the carpet staple along the line and through the carpet. (Fig 6) I started mine in the middle where I had the hem. The corners may require a bit of pulling while stapling. I folded the ends to achieve a clear look. After the outer face of the carpet is complete turn the panel over and staple the back edge of the strip, a firm tug may be required. (Fig 7). Once the strip has been attached, the visible side of the panel will be finished (Fig 8). 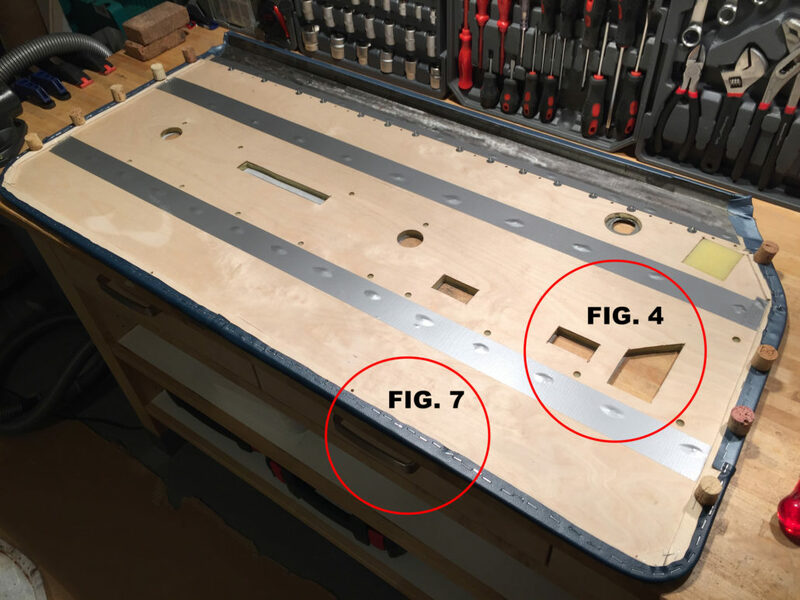 After attaching the metal strip that separates the carpet from the upper vinyl panels, the wood veneer panel and cut all the necessary holes, this stage of the project has been completed (Fig 9). In the next issue, I will explain how to cover the armrests and how to reinstall the door panel and accessories.